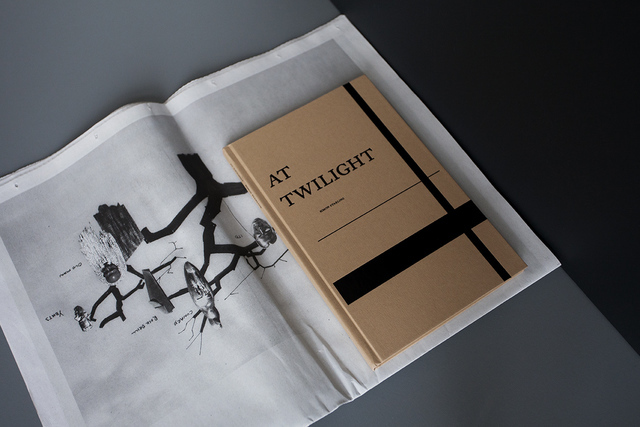 A publication in two parts: one a hard-bound book that includes the script for ‘At Twilight: A play for two actors, three musicians, one dancer, eight masks (and a donkey costume)’ by Graham Eatough and Simon Starling, first performed in Glasgow in 2016; and the other a tabloid-format newspaper that documents the exhibition 'At Twilight' and the live performances at Hollywood House, Glasgow. The publication includes texts by Katrina Brown, Director of The Common Guild, and Yukie Kamiya, Director of The Japan Society Gallery, alongside character biographies written by Simon Starling and source material selected by the artist. Designed by graphic design collective Åbäke to accompany the exhibitions ‘At Twilight' at The Common Guild 2 July – 4 September 2016 and 'At Twilight (After W.B. Yeats’ Noh Reincarnation)' at Japan Society, New York 14 October 2016 – 15 January 2017.